"I bow down to the guru who destroys ignorance and darkness and brings light into one's life." On July 23, a day after Guru Poornima, 'Mulam- the celebration of Guru Shishya parampara' was celebrated at Samuchchaya Auditorium, Kalagrama, Bengaluru. It was conceptualized and organized by Vyjayanthi Kashi of Shambhavi School of Dance, in collaboration with the Department of Kannada and Culture. 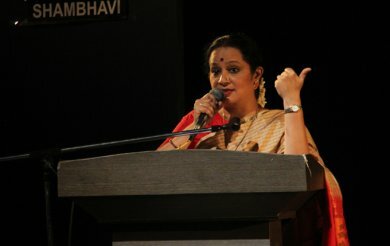 In spite of heavy rains, the auditorium was packed with students, art lovers and connoisseurs of art. It was an extraordinary evening well spent amidst many renowned gurus. The event was inaugurated by the chief guest Dwaraki Krishnaswamy. The first part of the program was a seminar, involving speeches by the invited Gurus, which were very educative and informative to one and all. 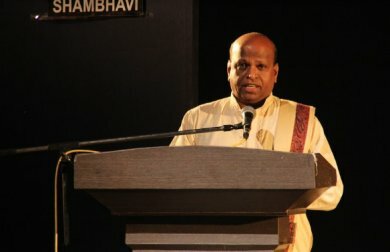 The event was kicked off by Karthik Hebbar, a renowned musician, who spoke about 'Guru Shishya Parampara in music and difference in teaching technique for male and female voices.' He said that there is no difference between the techniques used in teaching males and females. In his words, "Teaching is gender-neutral. Many times, a male can have a female voice and vice versa. Many renowned and successful musicians such as M.S.S. had opposite gender gurus; hence they couldn't imitate their gurus and were able to develop their own style. My advice to the students is not to copy or imitate your guru or any artist but to absorb the art from them and develop your own style. Only then can one be a good artiste. Each student is different and a teacher shouldn't stick to one predetermined curriculum but design the curriculum according to the student's capabilities. A guru must not only teach music but also teach his disciple how to sit, how to be calm and composed while learning, and how to recognize one's head voice, chest voice and abdominal voice. After a few years of learning, a guru should also teach the musicality, lyricism and spirituality of the compositions. A huge responsibility lies on the guru to pass on the guru shishya parampara tradition to the next generation in a proper way. At the same time, the student should learn the art with utmost discipline." He also mentioned that there is a lot of difference between learning in a guru's physical presence and through skype, where nuances of the art cannot be learnt. Karthik remembered his guru R.K Padmanabhan practicing for his concerts and him playing the tanpura for several hours on end. He said that he has learnt more by listening to his guru during these practice sessions. He concluded by crediting his guru for his fame and success. Artiste Sanjay Shantaram, who has been credited with having nurtured 50 Rangapraveshas by the age of 45, spoke about the difference between a guru and an acharya. He said, "An acharya is a post-graduate who has gained knowledge by reading scriptures but guru is the one who has realized through his experiences. All gurus are acharyas but all acharyas are not gurus. While an acharya answers your questions, a guru questions your answers". He also mentioned how the shishya should have the commitment, concentration, surrendering mind and will to practice while learning the art. He questioned the dancers who soon after finishing their vidwath or rangapravesha start teaching, calling themselves gurus! He said that he believes one can be a guru only when one is complete within. He advised the upcoming teachers to have respect and passion in their heart to teach and not just commercialize it. Dancer Pavitra Bhat from Bombay spoke about 'Rebinding the relation between a Guru and Shishya.' He opined that communication is very essential to bridge the gap between the student and the teacher. He said that it is very unfortunate when negative thoughts exist between the two and that the student must take the initial step to communicate with the teacher to maintain a good relationship. He also mentioned that leaving aside one's ego is very important in resolving any issues. Pavitra also categorized disciples into four types according to his guru. The first category is like petrol, where a student instantly reacts to the spark of the guru even from a great distance. The second type is like camphor, where the student's inner spirit awakens with just the touch of his guru. The third set of disciples is like coal, where the guru has to take great pains to awaken the student's spirit. The fourth is like a plantain stem, where the student is unresponsive, stern, and cold to his guru's efforts. Pavitra quoted Saint Kabir where he says that if a guru and god appear in front of him he would greet the guru first and then god because he is able to see god today, only because of his guru. Pavitra hence concluded by reminding everyone the importance of a guru in one's life. D. Keshava, dance and yoga director of Kalasri institution in Switzerland, spoke about 'Guru Shishya Parampara in the past and present as perceived abroad.' 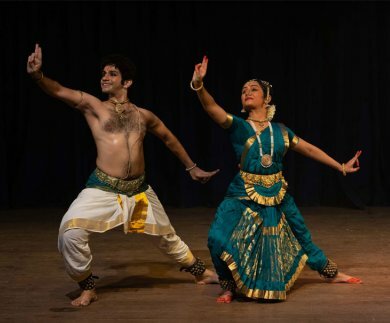 He opined that the way he learnt from his guru Venkatalakshamma of Mysore style Bharatanatyam, was much more original compared with how it is being taught now. In the olden days, the disciples would take a bath early in the morning and start off with reciting Sanskrit shlokas, doing warm-up exercises, doing adavus and then the items. Disciples would stay in their guru's house and learn from the guru for several years. While times have changed and that is not possible anymore for many, he said that it is very important to maintain the purity in what is being taught. He also said that while innovations are a necessity, it is also important to keep the tradition intact in order to pass on the guru shishya parampara for our future generations. The situations that he faces while teaching dance to his students abroad are very challenging as they are unaware of our culture and tradition including the mythological stories, which are very essential to dance training. 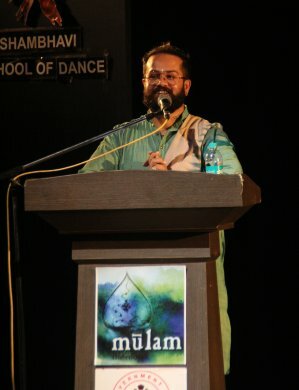 He expressed his helplessness in teaching dance just as body movements without giving any background, in many situations. 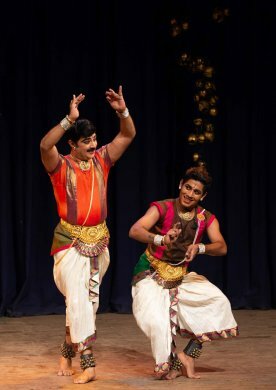 Keshava showed the differences in movements and gestures between Mysore and other styles of Bharatanatyam by enacting a few lines through his expressions. Nirupama Rajendra, dancer and director of Abhinava Dance Company, spoke about the 'Relevance of Guru Shishya Parampara in the present.' Nirupama began by recognizing and admiring the logo that was designed for this event. Mulam is the root, which is Brahma, the circle is Nataraja, and the leaf is Vishnu. The hand gestures denote the shastras, the gunghroos are the dancers and the school of dance denotes sadhgurus. She too was of the opinion that the art cannot be taught to the current generation in the same way that she had learned. She explained how the guru shishya parampara is being adopted in her dance school through education, motivation and inspiration. In education, an orientation program called 'Milan' is offered to all the new entrants as a cultural party in an entertaining way. Here, the new student is taught what it takes to learn an art, making them aware about the lineage of gurus, and the significance of learning dance. For motivation, in an event called 'Upakrama,' the students who have learnt dance for a few years get to present it in front of family and friends. For inspiration, in an event called 'Upaasana,' the students get to listen and learn from invited masters and scholars. In contrast to D. Keshava's opinion, Nirupama expressed that tradition is an ever flowing and developing parampara and the student is the most beautiful instrument through whom this parampara flows. She said that she believes that tradition is given to us as gold and it is the highest responsibility of the guru to pass it on with utmost love and care. Young dancer Prateeskha Kashi, daughter of Vyjayanthi Kashi, anchored the event with utmost liveliness and preciseness. Prateeksha conducted a very entertaining rapid round to all the speakers by firing them with interesting questions. Selflessness and love are the qualities that the guru should possess while ahankara (ego) and self praise are the qualities that guru should stay away from was one of the few rapid round answers that were appreciated by the audience. The seminar event was moderated by Poornima Gururaja, the artistic director of a dance school both in Boston and Bengaluru. She congratulated Vyjayanthi Kashi for organizing such an event and inviting various gurus to talk about very interesting and challenging topics. She said that India is the one and only country where guru shishya parampara has been propagated orally and is still alive even today. She agreed that the art should be taught with love, clarity and consistency and only then the parampara can be carried forward. She opined that art is greater than artist and that if a seed is in the shadows, then the guru himself should plant that seed in the sunlight in order for the seed to grow. With respect to keeping the tradition intact, she said that art is transitory, fluid and is meant to change. She stressed on the fact that when the art of architecture has changed from stone to steel and glass, art of doing surgery has changed from small tools to robots; we should also accept the changes in dance when it is subjected to evolution and innovation. 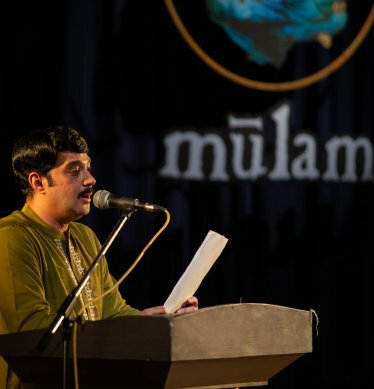 Vijay Kashi, actor and husband of Vyjayanthi Kashi, thanked all the speakers and welcomed the audience for the second segment of the Mulam event, which consisted of dance performances by the gurus and their shishyas. The very first performance was by Vyjayanthi Kashi and her disciple Lulu Wang from China. 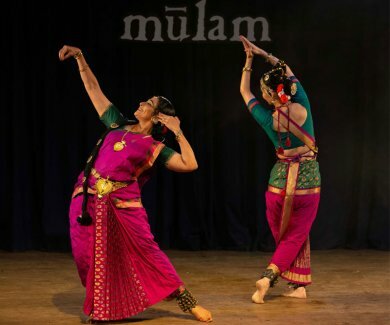 Their Kuchipudi duet performance started off with a Narayana Teertha's Ganesha stuti, "Jayajaya jitavairi" set in raga Hamsadhvani and adi tala. 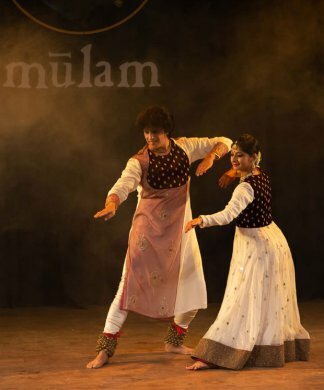 An enthralling and electrifying dance by this duo invoked an energetic mood and set the right ambience for the rest of the evening's performances. The next piece was a solo performance by Kashi, depicting the feelings of the young princess Gandhari, who is an ardent devotee of Shiva and who gets the boon of having 100 sons. The entire audience got involved and merged with the dancer, watching her expressing the agony and pain when she realizes that she was wedded to a blind prince. Kashi excelled in the Gandhari role with her expressions. The next solo performance was by Pavitra Bhat, who danced for Nandanar, a composition by Gopalakrishna Bharathi, set to raga Todi. Through Pavitra's expressions of devotion, he connected with the audience and was successful in instilling the element of devotion in them too. The next was a duet with his disciple Niyati Visal in which they performed for Brundavana raga Thillana. It was a delight to the eyes watching the duo as Radha and Krishna expressing shringara rasa. The next was a Kathak performance by gurus Nirupama and Rajendra, who danced for "Om namo bhagavathe vasudevaya," a composition sung by Pt. Jasraj and the music was by Praveen D. Rao. This was followed by another scintillating performance by this duo along with their disciple Rohini Prabhath. They together danced for a composition called 'Tarang' in which they spoke through their eyes, their footwork, and bols and thus carried the audience on the ebbs and tides of the dance. The concluding dance performance was by Dr. Sanjay Shantaram along with his disciple Anirudh Gopinath. They together performed for Pushpanjali, set in Kamavardhini raga, written and composed by Sanjay himself. The last piece was Rudraveena, where Sanjay danced as Ravana, an ardent devotee of Shiva, who plays veena using his intestine to please lord Shiva. Sanjay did great justice to his role as Ravana. The guru shishya parampara event was concluded beautifully with a small speech by the chief guest Dwaraki Krishnaswamy, a lyricist and music composer. She congratulated Vyjayanthi Kashi to have organized this unique event and for consistently arranging this event for five years in a row. The audience was soaked in dance and I was especially enthralled listening to all the gurus and watching them perform with their disciples. It is a rare opportunity and privilege for any disciple to be able to dance with his or her own guru. What more can a student ask for than to perform with his guru on a Guru Poornima day! In a time like this, where the teacher thinks twice before disciplining the student or where the student complains about the teacher for disciplining them, events like this are very much needed to bring gurus and shishyas together. I hope events like this are also organized in the West to bring awareness in students about the guru shishya parampara, culture and traditions.